He stands about 17″ tall total, 10″ of that being his body and the rest being his ears, which have flexible steel wires in them for posing. His body is made of fleece. He’s very comfortable and lightweight, and will be a perfect accessory for pictures! 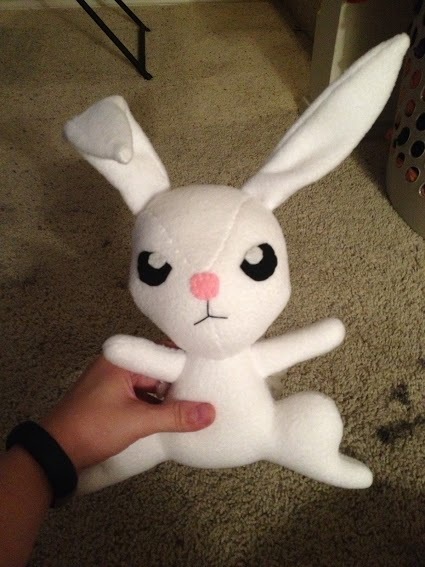 I’m very happy with this purchase, and definitely will turn to Stacey in the future for more custom plushies. Do be aware that commissions can take 4-6 weeks, so plan accordingly. I ordered mine in September and got him a week ago, but Stacey was good about letting me know what was going on ahead of time. You can find Zoobliez on etsy and on Facebook.